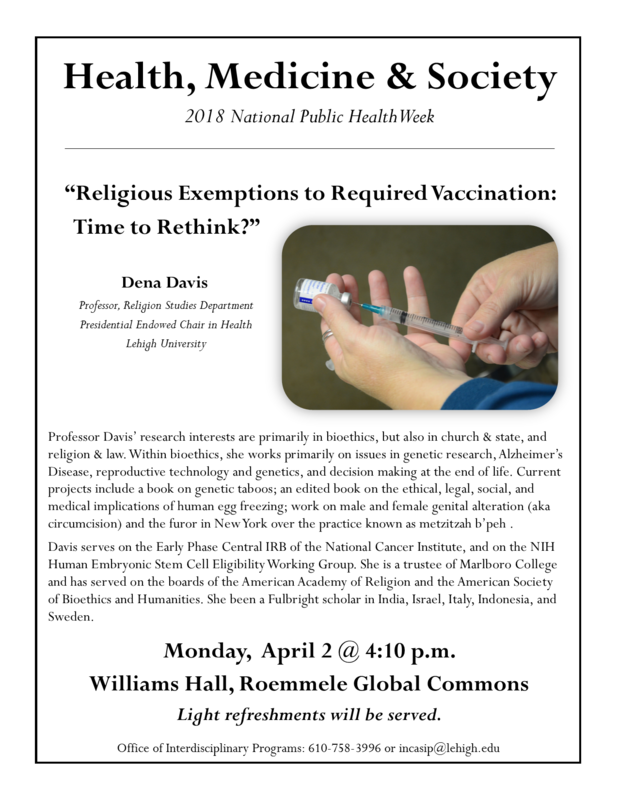 Religion Exemptions to Required Vaccination: Time to Rethink? Professor Davis’ research interests are primarily in bioethics, but also in church & state, and religion & law. Within bioethics, she works primarily on issues in genetic research, Alzheimer’s Disease, reproductive technology and genetics, and decision making at the end of life. Current projects include a book on genetic taboos; an edited book on the ethical, legal, social, and medical implications of human egg freezing; work on male and female genital alteration (aka circumcision) and the furor in New York over the practice known as metzitzah b’peh .Davis serves on the Early Phase Central IRB of the National Cancer Institute, and on the NIH Human Embryonic Stem Cell Eligibility Working Group. She is a trustee of Marlboro College and has served on the boards of the American Academy of Religion and the American Society of Bioethics and Humanities. She been a Fulbright scholar in India, Israel, Italy, Indonesia, and Sweden.